At the start of this year, it was rumoured that Roots MC Black Thought and production vet 9th Wonder were set to team up to release a collaborative EP. Now, further details on the effort have surfaced. 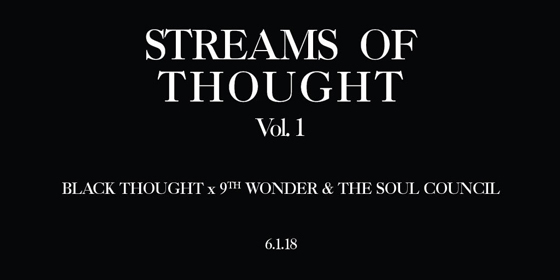 Taking to Twitter today, Black Thought revealed that he'll team with 9th Wonder and his eight-piece production collective the Soul Council to release a project titled Streams of Thought Vol. 1. A release date has been set for June 1. As Complex noted, Black Thought first made mention of the project in January at a screening of School Daze as part of his event series Black Thought Cinema Presents at New York's Gramercy Theater. A clip from the January evening [via Nodfactor] shows Black Thought announcing that the EP will be the first effort in a series, hence the Vol. 1 distinction. You can find that alongside the official announcement below. Black Thought and 9th Wonder last teamed up on single "Making a Murderer" in 2016, which also featured Styles P. He's also recently wowed listeners with his exceptional freestyle skill.